HÀ NỘI – The “Việt Nam Golden Book of Creativity 2016”, the first book to honour Vietnamese people’s creativeness in science and technology, made its debut yesterday in Hà Nội. The book, which was published on the 71st anniversary of country’s Independence Day on September 2, introduces 71 examples of research work and creative solutions in science and technology covering areas such as agriculture, health and industry. All the research and solutions are said to be highly practical and bring about pragmatic results in daily life. Addressing its launch, Politburo member and President of the Việt Nam Fatherland Front Nguyễn Thiện Nhân said the book aimed to honour researchers and research groups who have made outstanding works in social and applied science that considerably contribute to national socio-economic development. “It is a precious document which helps to encourage every citizen, State agency, organisation, and enterprise to actively join in creative activities, scientific and technological research, and put forth initiatives in all areas in order to improve productivity and product quality for successful international integration,” he said. On behalf of Vietnamese State and Party leaders, National Assembly Chairwoman Nguyễn Thị Kim Ngân congratulated the scientists and inventors whose research was selected for the book. 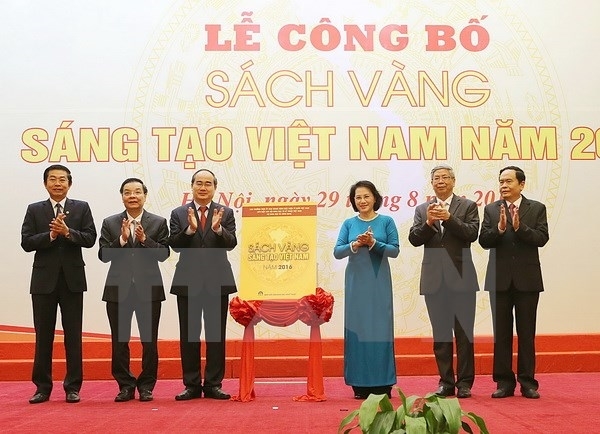 She also lauded the initiative to publish the book by the Việt Nam Fatherland Front, the Ministry of Science and Technology, and the Vietnam Union of Science and Technology Associations. “At the same time, it provides Vietnamese people nationwide an insight into scientific and technological solutions which have made up the nation’s achievements in the reform process over the past years,” she said. She hoped the book would contribute to building up a creative culture in Vietnamese people. She asked related agencies to continue to attach importance to and encourage industries, organisations and agencies at all levels, as well as Vietnamese people inside the country and overseas, to actively join in the campaign of promoting scientific and technological research and application to contribute to national development. At the ceremony, the organisers presented certificates and copies of the book to the researchers and groups whose works are introduced in the book. Among them are Mai Văn Cúc from Bình Phước Province, who created a biological trap to kill fruit flies; Phan Thị Thuận from Mỹ Đức Silk Ltd. Co, who invented a method to make silkworms weave quilts themselves; and Tẩn Mý Dao, a Dao ethnic woman from the mountainous Sìn Hồ District in Lào Cai Province, who managed to multiply a species of tree that is traditionally used in herbal medicine.